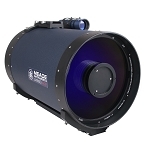 The 10" LX600 ACF Telescope with StarLock from Meade is a technologically advanced Cassegrain telescope with a computerized fork mount. This innovative design combined with Meade's Ultra High Transmission Coating ensures that images are bright, with high contrast and faithful color reproduction. 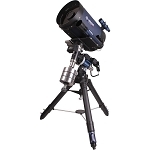 The included Giant Field Tripod has 3" diameter steel legs with a cast aluminum adjustable head, providing the LX600 with a professional-grade foundation for celestial observations. Meade engineers developed a new coma free design by combining a hyperbolic secondary mirror with a primary mirror and corrector lens that perform as a single hyperbolic element. This advanced coma free (ACF) design produces a flatter field of view that rivals traditional Ritchey-Chretien (RC) telescopes at a fraction of the cost. The ACF design even eliminates diffraction spikes and improves astigmatism, both of which are inherent in the traditional RC design. 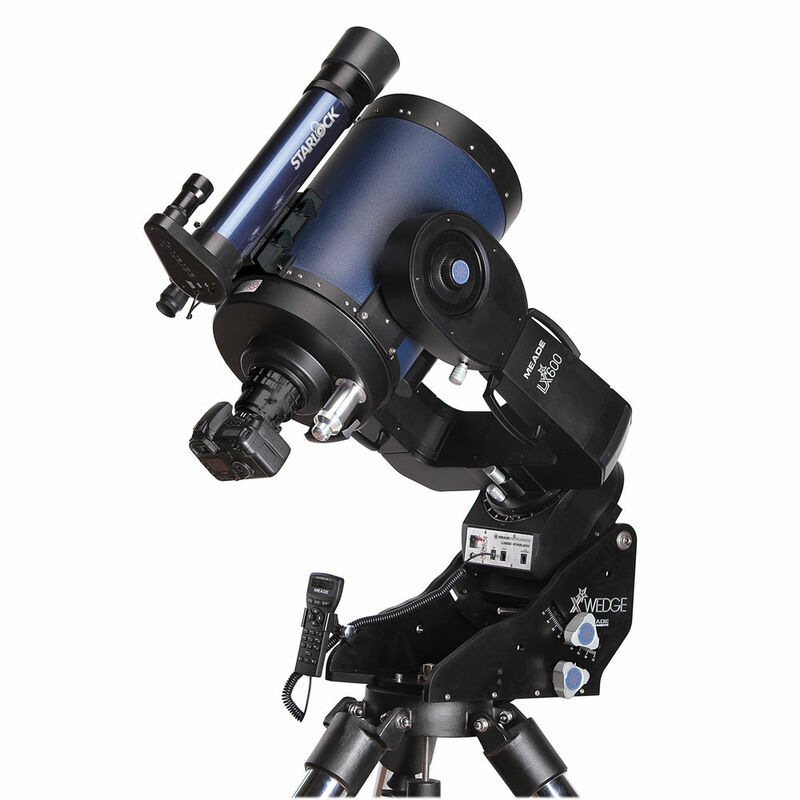 At the core of the LX600 Series' tracking and alignment system is Meade's StarLock technology. StarLock uses both a wide field and a narrow field digital camera to identify guide stars as faint as 11th magnitude, then communicates information to the right ascension and declination motors to track celestial objects for precise one arcsecond guiding. Unlike standard autoguiders, StarLock directly transmits specific real-time commands to each of the servo motors, resulting in maximum accuracy and faster guide corrections to within one arcsecond. 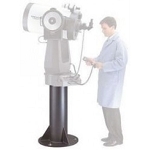 The LX600 is packaged with a heavy-duty double-tine fork that is engineered to accommodate the optical tube assembly, StarLock assembly, and cameras used for astrophotography. 5.75" worm gears in both RA and DEC axes provide smooth movement with minimal periodic error. This fork enables 180 degree range of motion, allowing the optical tube to slew from horizon to horizon without the meridian flip common with German equatorial mounts. 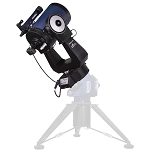 AutoStar II GoTo software makes setting up and observing celestial bodies with the LX600 both user-friendly and relatively easy. Over 144,000 objects are pre-loaded on the AutoStar handbox, all stargazers need to do is enter the moon, planet, star cluster, nebula or galaxy of their interest on the AutoStar handbox and the mount will automatically move the telescope into alignment. The LX600 with StarLock combines world-class optics with a robust yet portable mount and tripod. 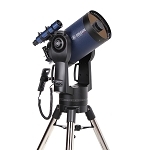 Paired with the AutoStar II GoTo software, this kit includes all the hardware and software that professional astronomers and astrophotographers need for years of superb observation. 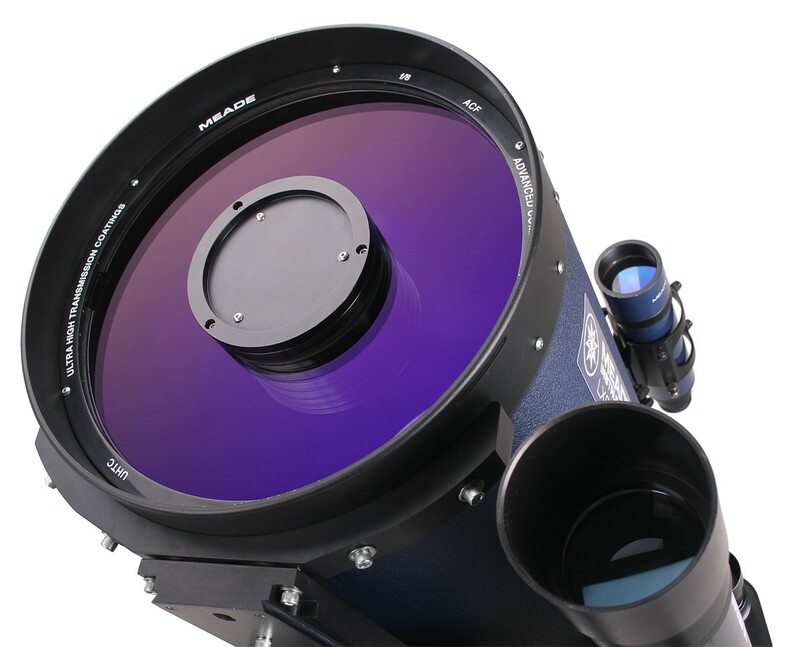 The fast f/8 Advanced Coma Free (ACF) optical system produces a wider, flatter field with no coma for pinpoint stars out to the edge of larger imaging sensors and extreme wide angle eyepieces. Flatter image fields and optimized color fidelity reward discerning astronomers and astrophotographers alike. Meade's patented ACF system also reduces the astigmatism and eliminates diffraction spikes found in most Ritchey-Chretien optical designs. Regardless of the celestial object viewed through the eyepiece, stargazers and astrophotographers will enjoy color faithful spectral reproduction with minimal color fringing and geometric optical distortion. A lightweight durable aluminum chassis reduces payload on the mount and offers excellent thermal stabilization characteristics. Ultra-High Transmission Coated borofloat glass delivers bright contrast-rich images, even through short focal length eyepieces that deliver extreme magnification. StarLock uses its two cameras to refine pointing to an accuracy of one arcminute, which ensures the selected object will end up on your imaging sensor, a must for those faint objects you cannot visually confirm. StarLock technology automatically centers alignment stars using a wide field and narrow field digital camera, taking the guesswork out of alignment. Once aligned, StarLock automatically guides the mount in real time, achieving a tracking accuracy of up to one arcsecond. The mount includes both mechanical locks and slow motion manual controls in both axes. The motion on each axis is driven by durable 5.75" worm gears that deliver precise movements with minimal periodic error, critical for long-exposure astrophotography. Additionally, this mount has a 180 degree range of motion that can move the optical tube from horizon to horizon without the meridian flip common in German equatorial mounts. The 144,000 object database puts moons, planets, star clusters, and galaxies at your fingertips. Simply push of the GoTo button and AutoStar II will align the optical tube with the celestial object of your interest. Three inch diameter chromed steel legs and cast aluminum tripod head make the LX600 Giant Field Tripod both stable and relatively lightweight. 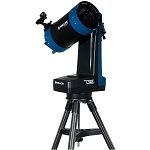 This research-grade telescope foundation has a head, adjustable from 34 to 54 inches, and leg levelers at the bottom of each leg for making quick and easy height adjustments. The completely redesigned Crayford-style internal focusing mirror system achieves zero image shift, eliminating the need for a mirror lock and integrates a dual speed, 7:1 reduction control for quick and easy adjustments. For astrophotographers requiring shorter exposure times and stargazers demanding a wider field of view, a specially designed focal reducer/field flattener accessory (sold separately) will turn the LX600's f/8 focal ratio into a super-fast f/5. Box Dimensions (LxWxH) 44.0 x 38.5 x 29.0"